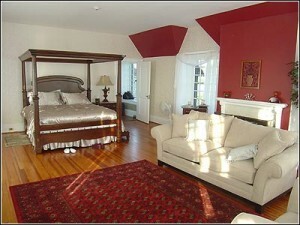 The spectacular castle on its own private island in the St. Lawrence is now open for the 2011 season. After a long winter of preparation, Singer’s staff are ready for the next busy months of tours, weddings and overnight guests. 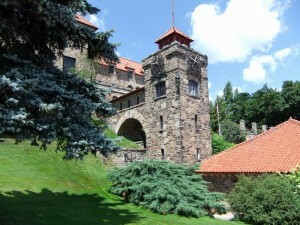 On May 21st, Singer Castle on Dark Island welcomed the first visitors of the 2011 season. A beautifully refurbished historic castle on its own private island, Singer has quickly become a popular attraction for tours and individual visitors – particularly as it may be the only private island castle in North America that accepts overnight guests! To welcome the thousands of visitors that will soon arrive, it takes a lot of preparation on the part of the Castle’s dedicated staff. Tom Weldon is the island’s manager, and the coordinating brains behind the many moving parts involved in running a castle, from renting out the Royal Suite and arranging weddings to managing island renovations and keeping everything in top condition. Few people may be aware of this, but the island’s caretaker, Scott, spends all year on the island – occasionally even trapped when the river ices over and becomes impassable by boat. Both have been eager for warm weather and the new season! Each day, boatloads of tourists arrive from the American side of the St. Lawrence River, filled with people excited to get a glimpse of an authentic, not to mention gorgeous, Scottish-style castle! Visitors tour the traditionally-maintained gardens, the many rooms illustrating the original décor, and even get a peek into the network of secret passageways that run behind the castle walls. The guided tours last for 45 minutes, and are led by expert staff members who know all of the castle’s many interesting stories and secrets. To take some of the magic home, there is a small gift shop featuring Singer Castle memorabilia like books and postcards, where you can also watch a film about the history of the island and castle. In 2010, a remarkable almost 30,000 visitors toured the lovingly-restored castle, a new record for Dark Island Tours that will hopefully be surpassed this season. Nothing beats feeling like the king or queen of your own private castle for a true luxury experience – and with its beautiful views and elegant furnishings, the Royal Suite makes for an extraordinary evening (or two!). The Suite contains a large master bedroom, a smaller bedroom, and a kitchenette and bathroom, sleeping a maximum of six guests. Once the final tour boat departs, the entire castle will be all yours – perfect for celebrating a special occasion (it is very popular for weddings and honeymoons) or just rekindling romance. Overnight guests are always thrilled by the unique experience of seeing both the amazing sunrises and sunsets out of the large windows. Whether you come for a tour of the castle or live like royalty (at least for a day or two) as an overnight guest, a visit to Singer Castle is an experience not to be missed. 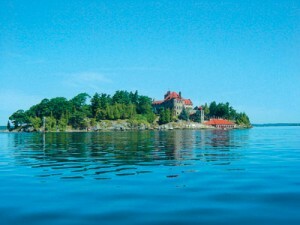 Package day tours from Rockport Cruises also include a stop at nearby Boldt Castle on Heart Island, and of course, incredible views of the dozens of inhabited small isles that dot the St. Lawrence River. A true island-lovers paradise!